Since I have a ton of things going on right now, I thought I should definitely add a big project for nap time today. Why not? Just like I should definitely be writing this post instead of working on other said important "things to do". Of course! 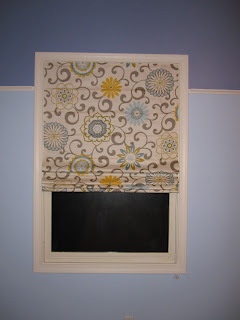 I finally found fabric earlier this week that I would be happy with to make this roman shade (at least for a while). I am not all that in to sewing...give me a needle and thread and I am good to go...but if I need to use my sewing machine...I'm going to drag my peddling foot for quite a while before busting into the project. So, I was thrilled to find this blog that showed me exactly how to make this roman shade with a cheap set of mini-blinds and a few yards of fabric with out sewing!! 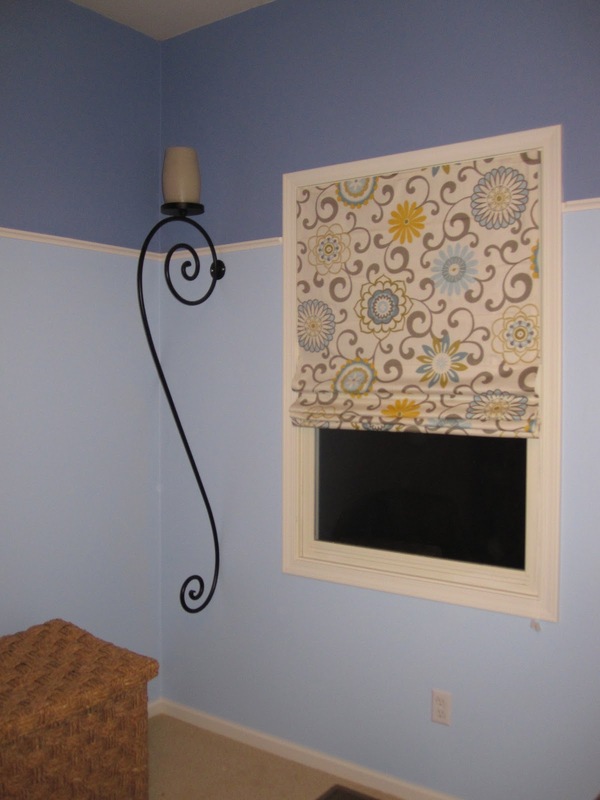 If you need a cheap fix for a window - give it a try! Not to mention, you can choose any fabric you want! It has taken some getting used to, but I am starting to love the bright blue shades we went with in this family room. I love that with some white trim, we are able to move away from the earth tones we have been forced to have with our wood trim and we can move into some more beachy hues. 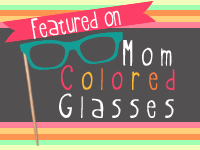 I am so excited to announce the newest giveaway! Rachel at Bing Art is just the sweetest thing and I am so honored to be able to give one of my lucky readers one of her paintings! This Mom has some serious talent, friends. Rachel is a full-time freelance artist and lives in Washington D.C. with her hubby and two adorable kiddos. Her original oil paintings can be found in private collections all over the world! Rachel focuses on contemporary and abstract land and seascapes. One of her paintings "Lighting Storm" will be used on the set of the new TV series "Save Me" set to air at the end of 2012. Awesome! One of my lucky readers will get to have one of her gorgeous paintings shipped right to your doorstep! 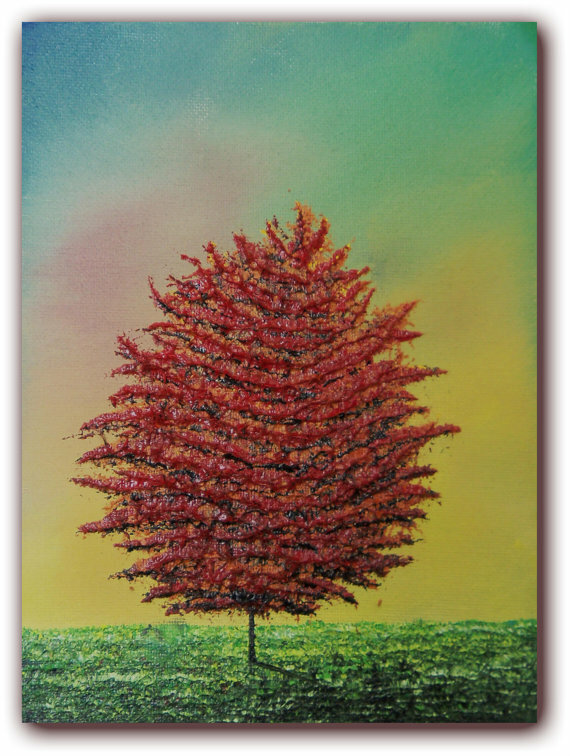 Just in time for fall, this is an original red tree oil painting on an autumn landscape. 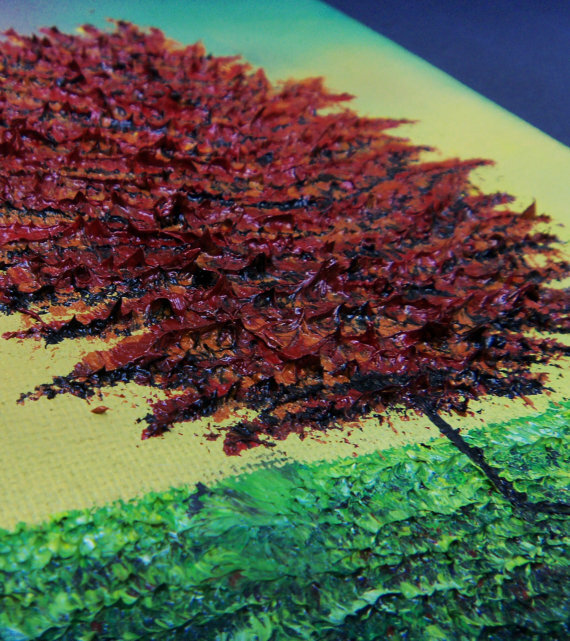 The contemporary tree art on textured canvas boasts a fall tree with thick foliage against a sunset sky. The fall leaves on the tree are heavily textured and pop out. 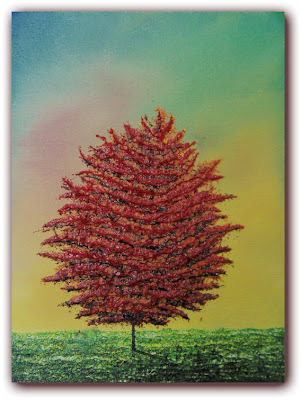 This piece is a tribute to summer's end and the beginning of autumn. I'm trying something new to make it easier for all of you to enter! Earn up to TEN entries below! You can also click on Bing Art's link in my sidebar to visit Rachel's Etsy Shop! I love the roman shades and the painting! You have definitely inspired me to get some stuff done around my house! I don't know how you do it all! I saw Myles at school today and he couldn't stop talking about his couch incident, lol! Really cool paintings - I like the Stormscape - so cool. So are the no sew roman shades, especially since I don't sew. First of all, I LOVE the new color!! I can't wait to see it next weekend! Secondly,I love the painting's featuring sunsets! :) Thirdly, I miss you and the family!!! I love your blue walls. Beautiful. I need someone crafty like you to come and take over my house for a week. PLEASE?!? I just found your blog and have loved getting to know you better. I hope you don't mind if I follow along!